The best way to see the old city in Tallinn! We offer an interesting and exciting way to examine the possibilities of Tallinn's Old Town. The particular value of Tallinn’s Old Town lies in its still remained medieval atmosphere and structure, which is disappeared in other Northern European capitals. In Tallinn's Old Town there is almost a complete street network from 11th-15th century and the same land borders with a large amount of original clearanced maintained buildings from 14th and 15th century. In medieval form has survived all the more important buildings, and also from that time lots of merchants and the citizen's housing together with the outbuildings and warehouses. You might say that Tallinn represents one of the best and preserved medieval city, and at the same time being the pearl of Estonian architecture. 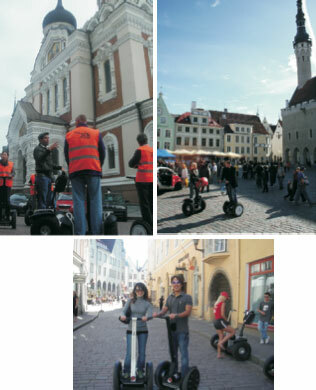 The adventure on a Segway in Tallinn’s Old City is interesting even for the person who hates culture, it is like floating above the other pedestrians, moving along very old cobbled streets, passing through narrow streets next to massive medieval buildings. For groups we offer a possibility to order a guided tour with our professional guide. Before the excursion, every person gets a quick teaching how to move on a Segway and an interesting journey may begin. The limit of the group is 12 people, in bigger groups we divide the gruoup to 2 or 3 smaller groups. 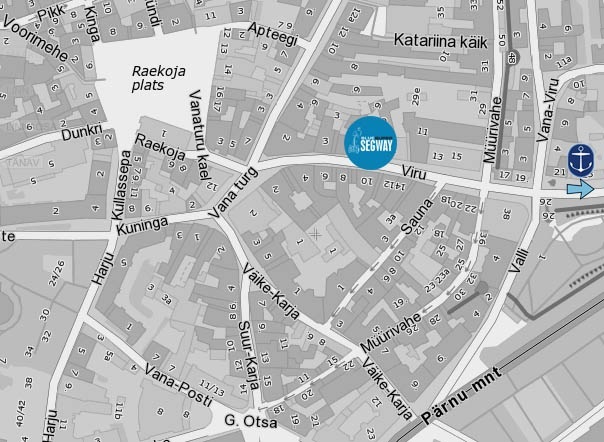 Our head office is located in Tallinn’s Old Town, near Raekoja square, address Vene street 3. Anyone can drive the Segway. It is recommended that the mass is 40-120 kg. Less than 12 years of age and children who weigh less than 40 kg can drive only with the permission of their parents and their responsibility. Since September 2009 we are opened in the Cruise Port of Tallinn. We are located near the port market and we offer a fast and interesting way to see the city. There is also a very popular individual tours in Tallnn’s Rocca al Mare Open Air Museum, where the territory is very large and the distance between objects is long. Estonian Open Air Museum is an exposure, which is required to investigate, collect and present the historic land, and the best examples of historical architecture collected all over Estonia, present day the museums territory is 84 hectares. In summer 2010 we plan to open several new rental places so that even people outside Tallinn can experience the ride on a Segway. Kuressaare is a city on the south coast of Saaremaa. In Old Town (mainly from 18th-19th century) there are survived two Churches, market, and, an old mill and also residential buildings. Baroque City Hall is from 17th century, when there was Swedish time. The biggest attraction is the castle from 14th century, present day inside the castle is the Museum of Saaremaa. 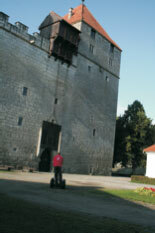 We want to offer the tourist who visites Kuressaare the mix of an old castle and moder technology like Segway. In addition we plan to open a rental place in Pärnu also. Pärnu is the summer capital of Estonia. We want to offer something fun to ride with in the beach and a variation to sunbathing and swimming. You need to have your passport, ID card or driving license to rent a Segway. We are open from April to October!